The Ilyushin Il-2 was a ground attack aircraft (Shturmovik) in the Second World War, produced by the Soviet Union in very large numbers. In combination with its successor, the Ilyushin Il-10, a total of 42,330 were built, making it the single most produced military aircraft design in all of aviation history, as well as one of the most produced piloted aircraft in history along with the Cessna 172 and the Polikarpov Po-2. 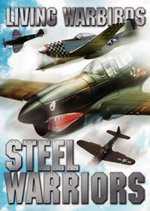 It is regarded as the best ground attack aircraft of World War 2. It was a prominent aircraft for tank killing with its accuracy in dive bombing and its 37mm guns penetrating their thin back armor. To Il-2 pilots, the aircraft was simply the diminutive "Ilyusha". To the soldiers on the ground, it was the "Hunchback," the "Flying Tank" or the "Flying Infantryman". Its postwar NATO reporting name was "Bark". The Il-2 aircraft played a crucial role on the Eastern Front, and in Soviet opinion it was the most decisive aircraft in the history of modern land warfare. Joseph Stalin paid the Il-2 a great tribute in his own inimitable manner: when a particular production factory fell behind on its deliveries, Stalin sent an angrily-worded cable to the factory manager, stating "They are as essential to the Red Army as air and bread." The idea for a Soviet armored ground-attack aircraft dates to the early 1930s, when Dmitry Pavlovich Grigorovich designed TSh-1 and TSh-2 armored biplanes. However, Soviet engines at the time lacked the power needed to provide the heavy aircraft with good performance. Il-2 was designed by Sergey Ilyushin and his team at the Central Design Bureau in 1938. TsKB-55 was a two-seat aircraft with an armoured shell weighing 700 kg (1,540 lb), protecting crew, engine, radiators, and the fuel tank. Standing loaded, the Ilyushin weighed more than 4,700 kg (10,300 lb), making the armoured shell about 15% of the aircraft's gross weight. Uniquely for a World War II attack aircraft, the armor was designed as a load-bearing part of the Ilyushin's monocoque structure, thus saving considerable weight. The prototype TsKB-55, which first flew on October 2, 1939, won the government competition against Sukhoi Su-6 and received VVS designation BSh-2. The prototypes - TsKB-55 and TskB-57 - were built at Moscow plant #39, which was the base for Ilyushin design bureau at that time. The BSh-2 was overweight and underpowered, with the original Mikulin AM-35 1,022 kW (1,370 hp) engine designed to give highest power outputs at high altitude. Because of this it was redesigned as the TsKB-57, a lighter single-seat design, with the more powerful 1,254 kW (1,680 hp) Mikulin AM-38 engine, a development of the AM-35 optimised for low level operation. The TsKB-57 first flew on 12 October 1940. The production aircraft passed State Acceptance Trials in March 1941, and was redesignated Il-2 in April. Deliveries to operational units commenced in May 1941. The IL-2 is a single-engine, propeller driven, low-wing monoplane of mixed construction with a crew of two (one in early versions), specially designed for assault operations. The most notable design feature of the aircraft was the inclusion of armor in an airframe load-bearing scheme. Armour-plates replaced the frame and paneling throughout the nacelle and middle part of the fuselage. An armored hull made of riveted homogeneous armor steel AB-1 (AB-2), secured the aircraft’s engine, cockpit, water and oil radiators, and fuel tanks. The Il-2 was eventually produced in vast quantities, becoming the single most widely produced military aircraft in aviation history. However, only 249 had been built by the time Nazi Germany invaded the Soviet Union on 22 June 1941. As a result, "the production of Shturmoviks rapidly gained speed. Stalin's notion of the Il-2 being 'like bread' to the Red Army took hold in Ilyushin's aircraft plants and the army soon had their Shturmoviks available in quantity." The first use in action of the Il-2 was with the 4th ShAP (Ground Attack Regiment) over the Berezina River days after the invasion began. So new were the aircraft that the pilots had no training in flight characteristics or tactics, and the ground crew no training in servicing or re-arming. The training received only enabled the pilots to take-off and land, none of the pilots had fired the armament, let alone learned tactics. Only 249 Il-2s were available on 22 June 1941. In the first three days, 4 ShAP had lost 10 IL-2s to enemy action, but a further 19 were lost to other causes. 20 pilots were killed in these incidents. By 10 July, 4th ShAP was down to 10 aircraft from a strength of 65. Tactics changed as Soviet aircrew became used to the Il-2's strengths. Instead of a low horizontal straight approach at 50 metres altitude, the target was usually kept to the pilot's left and a turn and shallow dive of 30 degrees was utilized, using an echeloned assault by four to 12 aircraft at a time. Although the Il-2's RS-82 and RS-132 rockets could destroy armored vehicles with a single hit, they were so inaccurate that experienced Il-2 pilots mainly utilized the cannon. Another powerful weapon of the Il-2 was PTAB-2.5-1.5 HEAT bomblets (ProtivoTankovaya AviaBomba, Anti-Tank Aviation Bomb - the number means that it was the size of a 2.5 kg (5.5 lb) bomb, but weighed only 1.5 kg (3.3 lb) due to the empty space in the shaped charge). Up to 192 were carried in four external dispensers (cluster bomb) or up to 220 in the internal weapon bays. The HEAT charge could easily penetrate the relatively thin upper armor of all heavy German tanks. PTABs were first used in large scale in the Battle of Kursk. Thereafter, the Il-2 was widely deployed on the Eastern Front. The aircraft was capable of flying in low-light conditions and carried weaponry capable of defeating the thick armor of the Panther and Tiger I tanks. They were also proved capable of defending themselves against enemy aircraft, claiming an occasional Messerschmitt Bf 109. Ground forces highly valued the work of aviation on the battlefield. In a number of instances enemy attacks were thwarted thanks to our air operations. Thus on 7 July enemy tank attacks were disrupted in the Kashara region (13th Army). Here our assault aircraft delivered three powerful attacks in groups of 20-30, which resulted in the destruction and disabling of 34 tanks. The enemy was forced to halt further attacks and to withdraw the remnants of his force north of Kashara. -Glantz and Orenstein 1999, p. 260. In the Battle of Kursk, Gen. V. Ryazanov became a master in the use of attack aircraft en masse, developing and improving the tactics of Il-2 operations in co-ordination with infantry, artillery and armoured troops. Ryazanov was later awarded twice the Gold Star of Hero of Soviet Union, and the 1st Attack Aircraft Corp under his command became the first unit to be awarded the honorific title of Guards. However the Sturmovik suffered heavy losses. The Luftwaffe command claimed 6,900 Il-2s in 1943 and 7,300 in 1944. Although these figures were exaggerated by a factor of 2 to 2.2, the actual losses were subsustantial. In 1943, one loss corresponded to 26 Sturmovik sorties. Approximately half of those lost were shot down by fighters, the rest falling to antiaircraft fire. The main problem with the Il-2 was the inaccuracy of its attacks. Towards the end of war the Soviets were able to concentrate massive numbers of Shturmoviks to support their main offensives, but particularly against dug-in and armoured targets the actual effect was often more psychological than actual physical destruction of targets. In the 9 June offensive in the Karelian Isthmus, Finland found its AA forces far too few in numbers to counter the Pe-2 and Il-2 armadas, but also quickly found out that the Il-2 attacks typically missed their marks widely, particularly with bombs. While some attacks against large unprotected targets such as horse and truck convoys and rail yards had devastating results, attacks against dug-in point targets were usually ineffective. Particularly the frequent duels between dug-in 20/40mm AA guns and Il-2 attackers never resulted in the complete destruction of the gun, while many Il-2s were brought down in these attacks. 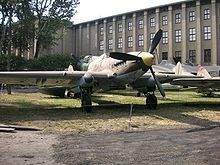 The heavy armour of the Il-2 also meant that it would typically carry only comparatively light bombloads, which together with the poor accuracy of its attacks made it a far less deadly attack aircraft than the contemporary Allied fighter-bombers such as the P-47 Thunderbolt and Hawker Typhoon. Particularly the rocket projectiles were not effective, even the larger RS-132 (four carried) having a warhead with a mere 0.9 kg of explosive. This compares poorly to the P-47's typical load of ten 5" HVARs each with 21 kg warhead, or the 8 to 12 60 lb (27 kg) warhead RP-3 rockets of the Hawker Typhoon. Likewise the bombs the Shturmovik carried were usually only 50 kg (rarely 100 kg), a size usually too small to compensate for the typically wide miss distance. To compensate for the low accuracy of the Il-2 bombsight, in the summer of 1943, the Soviet Command decided to use shaped-charge armour-piercing projectiles against enemy armoured vehicles, and the PTAB-2.5-1.5 SCAP aircraft bomb was put into production. These small-calibre bombs were loaded directly into the bomb bays and were dropped on the enemy vehicles from altitudes up to 100 meters (328 ft). As each Il-2 could carry up to 192 bombs, a fire carpet 70 meters (229 ft.) long and 15 meters (49 ft) wide covered the enemy tanks, giving a high "kill" probability. Pilots of 291st ShAP were the first to use the PTAB-2.5-1.5 bombs. During one sortie on 5th June 1943, six attack aircraft led by Lt. Col. A. Vitrook destroyed 15 enemy tanks in one attack, and during five days of the enemy advance, the 291st Division destroyed and damaged 422 enemy tanks. Thanks to the heavy armor protection, an Il-2 could take a great deal of punishment and proved difficult for both ground and aircraft fire to shoot down. One Il-2 in particular was reported to have returned safely to base despite receiving more than 600 direct hits and having all its control surfaces completely shredded as well as numerous holes in its main armor and other structural damage. Some enemy pilots favored aiming down into the cockpit and wing roots in diving attacks on the slow, low-flying Il-2 formations. Several Luftwaffe aces claimed to attack while climbing from behind, out of view of the rear gunner, and aim for the Il-2's non-retractable oil cooler. The veracity of this has been disputed by some Il-2 pilots in postwar interviews, since Il-2s typically flew very close to the ground (cruise altitudes below 50 m (160 ft) were common) and the radiator protruded a mere 10 cm (4 in) from the aircraft. A major threat to the Il-2 was German ground fire. In postwar interviews, Il-2 pilots reported 20 mm (0.79 in) and 37 mm (1.46 in) artillery as the primary threat. While the fabled 88 mm (3.46 in) calibre gun was formidable, low-flying Il-2s presented too fast-moving a target for the 88's relatively low rate of fire and while occasional hits were scored, Soviet pilots apparently did not treat the "88" gun with the same respect as high-altitude Western heavy bomber crews. Similarly the attempts in Finland during summer -44 to augment the small numbers of 20/40mm AA in the field army by heavier 76mm guns drawn from homeland defence proved also relatively ineffective and few Il-2s were downed despite attempting different tactics with time-fuzed fragmentation, contact-fuzed, and shrapnel ammunition: the heavy guns simply lacked the reaction times to take advantage of the brief firing opportunities presented by the low-altitude Il-2 attacks. Single-barrel 20mm guns were also found somewhat inadequate due to limited firepower: one or two shells were often not enough to destroy the Il-2, and unless the Il-2 was attacking the gun itself, thus presenting effectively a stationary target, scoring more hits during a firing opportunity was rare. However, a single hit from a 40mm AA gun was usually enough to bring down an Il-2. Heavy losses to enemy fighters forced the addition of a rear gunner; early IL-2s were field modified by cutting a hole in the fuselage behind the cockpit for a gunner sitting on a canvas sling armed with a 12.7 mm UBT machine gun in an improvised mounting. The semi-turret gun mount allowed the machine gun to be fired at angles of up to 35� upwards, 35� to starboard and 15� to port. Tests showed that maximum speed decreased by between 10 and 20 km/h (6.2-12.4 mph) and that the two-seater was more difficult to handle. At the beginning of March 1942, a production two-seat Il-2 with the new gunner's cockpit began manufacturer tests. The second cockpit and armament increased all-up weight by 170 kg (374 lb) so the flaps were allowed to be deployed at an angle of 17� to avoid an overly long takeoff run. The new variant had an lengthened fuselage compartment with an extended canopy offering some protection from the elements. 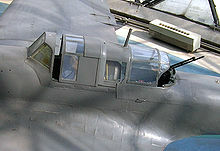 Unlike the well-armoured cockpit of the pilot compartment with steel plating up to 12 mm (0.47 in) thick behind, beneath and on both sides as well as up to 65mm thick glass sections, the rear gunner was provided with 6 mm (.23 in) thick armour, only effective against rifle-calibre rounds. To improve performance, the Mikulin Design Bureau started work on an uprated AM-38 engine. The new engines produced 1,700 hp at takeoff and 1,500 hp at 750 meters. 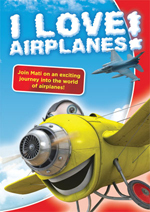 They gave an improved takeoff and low-altitude performance. On 30 October 1942, production Il-2s powered by AM38s were used on the Central front for the first time when they successfully attacked Smolensk airfield occupied by Germans. The Shturmovik rear guns proved to be effective against hostile fighters, and during the service trials alone, gunners shot down seven Bf 109s and repulsed many attacks. In January 1943 two-seat attack aircraft powered by uprated AM-38F engines (Forseerovannyy - uprated) began to arrive at front line units. Nonetheless, the death rate among the air gunners remained exceptionally high and not until late models produced after 1944, did the 13 mm (.5 in) rear plate of the armour shell get moved rearwards into the (wooden) rear fuselage to allow a gunner to sit behind the fuel tank. The armour did not extend to the rear or below although side armour panels were riveted to the rear armour plate to protect the ammunition tank for the UBT machine gun, providing some measure of protection. The modifications including adding the rear gunner and gun had added weight behind the cg, resulting in "marginal" stability and handling characteristics that were "barely acceptable". This was the reason for the swept back outer wings in later Il-2s. While the Il-2 proved to be a deadly air-to-ground weapon, heavy losses resulted from its vulnerability to fighter attack. Consequently, in February 1942, the two-seat design was revived. The IL-2M, with a rear gunner under the stretched canopy, entered service in September 1942 with surviving single-seaters eventually modified to this standard. Later changes included an upgrade from 20 mm to 23 mm to 37 mm cannons, aerodynamic improvements, use of wooden outer wing panels instead of metal and increased fuel capacity. In 1943, the IL-2 Type 3 or Il-2m3 came out with redesigned wings that were swept back 15 degrees on the outer panels, and nearly straight trailing edges, resulting in a wing planform somewhat like the AT-6 trainer. Performance and handling were much improved and this became the most common version of the Il-2. A radial engine powered variant of the Il-2 with the Shvetsov ASh-82 engine was proposed in 1942 to remedy projected shortages in Mikulin inline engines. However, the ASh-82 was also used in the new Lavochkin La-5 fighter which effectively secured all available engines to the Lavochkin bureau. The radial engine Sukhoi Su-2 ground attack aircraft was produced in small quantities, but was generally considered unsuitable due to inadequate performance and lack of defensive armament. Soviet anti-aircraft artillery frequently mistook it for German aircraft, often with lethal consequences.The main defensive tactic was flying low and power down as the fighters closed in to let the fighter overshoot and fly into the IL-2's firing range. Due to shortage of fighters, in 1941-1942, Il-2s were occasionally used as fighters. 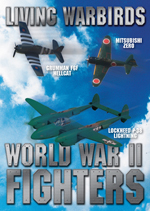 While outclassed by dedicated fighters like the Messerschmitt Bf 109 and Focke-Wulf Fw 190, in dogfights, the Il-2 could take on other Luftwaffe aircraft with some success. German front line units equipped with the Henschel Hs 126 suffered most of all from the ravages of Il-2s. Il-2 pilots also often attacked close formations of Junkers Ju 87s, as the 7.92 mm machine guns of the Stukas were ineffective defensively against the heavily armoured Shturmoviks. In the winter of 1941-1942, Il-2s were used against Luftwaffe transport aircraft, and became the most dangerous opponent of the Junkers Ju-52/3m. Pilots of 33rd GvShAP were the most successful in these operations, but no less successful were units operating near Stalingrad. Their targets were not only Ju 52s but also Heinkel He 111 and Focke-Wulf Fw 200 Condor bombers, delivering supplies to the besieged German troops. But losses were very high, the highest of all types of Soviet aircraft. Sturmovik losses (including Il-10 type), in 1941-1945, were of 10,762 aircraft (533 in 1941, 1,676 in 1942, 3,515 in 1943, 3,347 in 1944 and 1,691 in 1945). Among the pilots who gained fame flying the Il-2 was Senior Lieutenant Anna Yegorova, who flew 243 missions. She was decorated three times. One of these awards was the Gold Star of Hero of the Soviet Union that she had received "posthumously" in late 1944, as she was presumed dead after being shot down. She managed to survive imprisonment in a German POW camp. Junior Lieutenant Ivan Grigorevich Drachenko, another Il-2 pilot, was reputedly one of only four men who were decorated as both Heroes of the Soviet Union and also won all three of the Orders of Glory. Pilots Begeldinov, Mylnikov, Alekseenko and Gareev received two gold stars of the Hero of the Soviet Union; the last of them received both stars in one day. Hero of the Soviet Union recipient T. Kuznetsov survived the crash of his Il-2 in 1942 when shot down returning from a reconnaissance mission. Kuznetsov was able to escape from the wreck and hid nearby. To his surprise, a German Bf 109 landed near the crash site and the pilot began to scrounge around the wrecked Il-2 for souvenirs. Thinking quickly, Kuznetsov ran to the German fighter and used it to fly home, barely avoiding being shot down by Soviet fighters in the process. Cosmonaut Georgi Beregovoi flew 185 missions on Il-2s. In 1962, he joined the Soviet space program and flew into space on Soyuz 3 in 1968. Typical of Soviet Second World War aircraft, many Il-2s were "gifts" presented to specific pilots and partially paid for by organizations like hometowns, factories or comrades of another fallen pilot. The most famous of these was an aircraft purchased with the savings of a seven-year-old daughter of the fallen commander of the 237th ShAP. Learning of her father's death, the girl sent 100 rubles directly to Stalin asking him to use the money for an Il-2 to avenge her father. Remarkably, Stalin actually received the letter and 237th ShAP received a new Il-2m3 with the inscription "From Lenochka for father" on the side. After the war, the Il-2 could be found in service with several Eastern European countries, with most of the Il-2/10 aircraft eventually scrapped with the advent of military jets. Only a handful of Il-2s survive to this day, including museum rebuilds of crashed airframes. In recent years, several Il-2 wrecks have been located and recovered from Lake Balaton, a large, shallow lake in Hungary, which is located near the historic site of a large World War II tank battle (see Operation Frx�hlingserwachen). Two-seat prototype, AM-35 engine, first flight: 2 October 1939. VVS designation for TsKB-55 prototype. Single-seat prototype, AM-38 engine, first flight: 12 October 1940. Single-seat serial airplane, AM-38 engine, first flight 29 December 1940, some delivered to combat units in May-June 1941. Renamed to Il-2 in April 1941. Cannons 20 mm ShVAK or 23 mm VYa (depending on factory which manufactured Il-2). Two-seat version, AM-38 engine, first action 30 October 1942 near Stalingrad. Maximum bomb load reduced from 600 kg to 400 kg. Used on edges of flight formations for defence against German fighters. Quickly replaced by "Il-2 production of 1943". Referred in west as "Il-2M". Powered by an upgraded AM-38F engine. Delivered to front units since early 1943. In 1943, 20 mm ShVAK armed Il-2 production faded out, leaving only 23 mm VYa versions. Referred in west as "Il-2 Type 3M". Based on two seat Il-2, armed with Nudelman-Suranov NS-37 instead of 20/23 mm cannons, this version is an approach to anti-tank airplane, prepared for the Battle of Kursk. However, combat effectiveness was quite low and production of version was limited to about 3,500. Moreover, bomb load decreased from 600 kg to 200 kg. It was replaced by conventional Il-2 attackers armed with cassettes with cumulative bomblets. Il-2 production 1944 "wing with arrow"
Referred in West as "Il-2M3" or "Il-2 Type 3". As more duralumin became available for the Soviet aviation industry, the Il-2 received a set of all-metal wing panels. At the same time, the outer wing planform was swept back, with a straight trailing edge, since the centre of gravity shifted back after the gunner was added. The wing planform change regained controllability of the two-seat Il-2 back to level of the single-seat Il-2. Training version, also known as UIl-2. Torpedo bomber version for the Soviet Navy with removed 23 mm cannons (for saving weight), able to carry a single 45 cm (18 in) torpedo, largest sunk ship was about 6,000 tons of displacement. Existence of version is currently disputed. A backup project prepared while plants producing AM-35/AM-38 were evacuated. Trials demonstrated that with fighter engine loss of low-altitude performance and controllability was unacceptable. There are several aircraft in Eastern Europe museums, which have been stored there after decommissioning and, though, secured in their original design and condition. Also, a new wave of restoration has arisen at the end of the 20th century, resulting in some more aircraft to appear in static expositions. Such restored aircraft are based (as usual) on the original armour compartment (cowlfaps plus cockpit) and original engines, which can still be found on the battlefield wreck places in distant regions. 3. Original Il-2 is now at National Aviation Museum in Krumovo, Bulgaria. Bulgarian Air Force - received 120 Il-2 and 10 training Il-2U in 1945. The type was operated between 1945 and 1954. Czechoslovakian Air Force - received 33 Il-2 and 2 training Il-2U aircraft. This type was operated between 1944 and 1949. Air Force of the Polish Army - (after 1947 Polish Air Force) received about 230 Il-2 aircraft between 1944 and 1946. All were retired in 1949. Picture - A restored Il-2 at Sx�r-Varanger museum in Norway. Bergstrx�m, Christer. Bagration to Berlin - The final Air Battle in the East 1944-45. Hersham UK, Classic Publications, 2008. ISBN 978-1-903223-91-8. Bergstrx�m, Christer. Barbarossa - The Air Battle: July-December 1941. London: Chevron/Ian Allen, 2007. 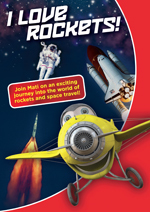 ISBN 978-1-85780-270-2. Glantz, David M. and Harold S. Orenstein. The Battle for Kursk 1943: The Soviet General Staff Study. London: Frank Cass, 1999. ISBN 0-71464-493-5. Green, William and Gordon Swanborough. "The Annals of Ilyusha: Ilyushin's Proliferous Shturmovik." Air Enthusiast, Issue Twelve, April-July 1980, pp. 1-10, 71-77. Bromley, Kent, UK: Pilot Press. ISSN 0143-5450. Hardesty, Von. Red Phoenix: The Rise of Soviet Air Power, 1941-1945. Washington, DC: Smithsonian Books, 1982. ISBN 1-56098-071-0. Matricardi, Paolo. Aerei Militari: Bombardieri e da trasporto. Milano, Mondadori Electa, 2006. NO ISBN. Ovčx�čx�k, Michal and Karel Susa. Ilyushin Il-2 Shturmovik: Il-2 Type 3, Il-2 Type 3M,Il-2KR, UIl-2. Prague, Czech Republic: 4+ Publications, 2006. ISBN 80-87045-00-9. Rastrenin, O. IL-2 Sturmovik Guards Units of World War 2 (Osprey Combat Aircraft, no 71). Oxford, UK: Osprey Publishing, 2008. ISBN 978-1-84603-296-7. Sakaida, Henry. 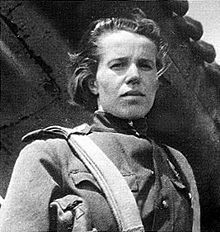 Heroines of the Soviet Union: 1941-45. Oxford, UK: Osprey Publishing, 2003. ISBN 978-1-84176-598-3. Shores, Christopher. Ground Attack Aircraft of World War II. London: Macdonald and Jane's, 1977. ISBN 0-35608-338-1.